Durable self-skinned polyurethane microcellular foam, perfect for multi task and tough usage environments. These chairs are resistant to chemicals, grease, oil and body fluids. This is what I would call an industrial application Lab chair. The Dove Lab chair by Allseating delivers the clean ability , durability and comfort that healthcare, laboratories and pharmaceutical environments need. I recommend the Allseating Dove Lab chair in tough environments where a durable seat is essential. This can go in garages, warehouses, drive thru stations, plants, warehouses and just about anywhere that an end-user requires a seating surface that can be wiped clean. 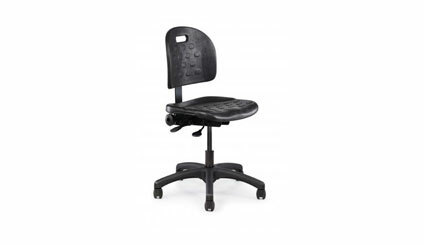 The Allseating Dove Polyurethane Lab chair comes in a stool height and in a scooter stool as well.